The following information describes supports and services to help students and young adults pursue employment at different ages and stages of life. High school transition planning officially begins at age 16, but you can start as early as age 14. Be sure to include employment-related goals in the student’s IEP, such as: identifying career interests and abilities; learning self-advocacy and social skills; riding the bus; improving communication; and using technology. 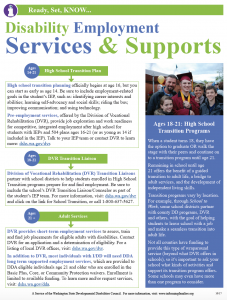 Pre-employment services, offered by the Division of Vocational Rehabilitation (DVR), provide job exploration and work readiness for competitive, integrated employment after high school for students with IEPs and 504 plans ages 16-21 (or as young as 14 if included in the IEP). Talk to your IEP team or contact DVR to learn more. DVR partners with school districts to help students enrolled in High School Transition programs prepare for and find employment. Be sure to include the school’s DVR Transition Liaison/Counselor as part of the student’s IEP team. For more information, visit DVR’s school transition page, or call 1-800-637-5627. When a student turns 18, they have the option to graduate OR walk the stage with their peers and continue on to a transition program until age 21. Remaining in school until age 21 offers the benefit of a guided transition to adult life, a bridge to adult services, and the development of independent living skills. Transition programs vary by location. For example, through School to Work, some school districts partner with county DD programs, DVR and others, with the goal of helping students to leave school with a job and make a seamless transition into adult life. Not all counties have funding to provide this type of wraparound service (beyond what DVR offers in schools), so it’s important to ask your school what kinds of activities and support its transition program offers. Some schools may even have more than one program to consider. DVR provides short-term employment services to assess, train and find job placements for eligible adults with disabilities. Contact DVR for an application and a determination of eligibility. Click here for a listing of local DVR offices. In addition to DVR, most individuals with I/DD will need DDA long term supported employment services, which are provided to DDA eligible individuals age 21 and older who are enrolled in the Basic Plus, Core, or Community Protection waivers. Enrollment is limited to available funding. To learn more and/or request services, visit DDA’s website.